Instead of sending images as attachments, you can add them inline to the text of your emails in Mozilla Thunderbird. You can describe the mountain you climbed and the fish you caught in countless words of flowery language. Or you can just send a picture. There's great joy and value to both, and maybe you want to combine written text and picturesque imagery in one email. Then the latter is best included inline in the body of your message, intermingling nicely with the text. For whatever reason you want to send a picture inline, it's easy with Mozilla Thunderbird. Create a new message in Mozilla Thunderbird. Put the cursor where you want the image to appear in the body of the email. Select Insert > Image from the menu. Use the Choose File... selector to locate and open the desired graphic. If your image is larger than some 640x640 pixels, consider shrinking it to more handy proportions. This text will appear in the plain text version of your email. People who choose to see only this version can still get an idea of where the image—which is still available as an attachment—appears. 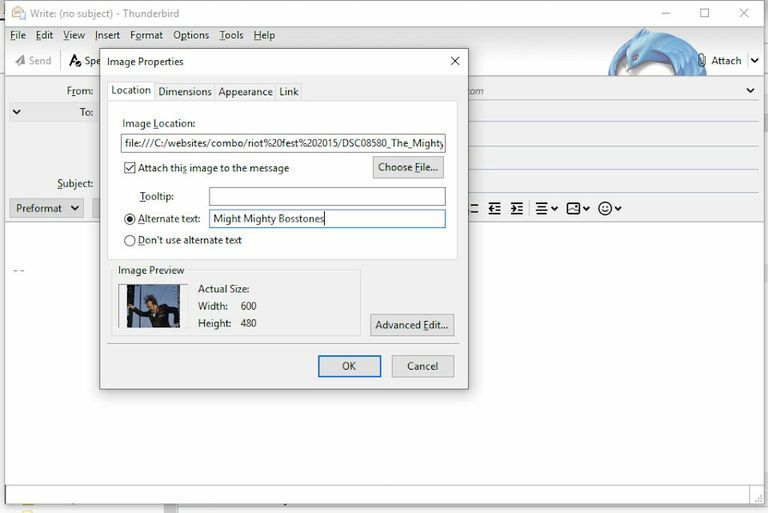 With a bit of trickery, you can also make Mozilla Thunderbird include a picture stored on your web server inline without adding a copy as an attachment. Copy the image's address in your browser. The picture must be accessible on the public web for all recipients to be able to see it. Select Insert > Image… from the message's menu. Put the cursor in the Image Location: field. Press Ctrl-V or Command-V to paste the image address. Add some alternative text that will appear in the email message if the image you linked to cannot be accessed. Make sure Attach this image to the message is not checked. How Do You Put an Image into a Yahoo! Email? Need to Add Images to Your Signature in Mozilla Thunderbird?